Today's Mars Photo is of Phobos, one of the Martian Moons. Phobos is 27 km at its longest point and orbits Mars at about 3000 miles above the surface in a little over 7 hours. This image was taken by the Mars Reconnaissance Orbiter on March 23 2008. The surface is covered with craters, but the largest one, Stickney crater, can be seen on the right side of this image. This image links to an image of Phobos' shadow passing over Mars, as taken by the Viking 1 Orbiter. SpaceX has unveiled plans to create and begin testing a completely reusable Falcon 9, though a date for such a test has not been established. SpaceX is hoping to lower costs of launches by allowing the same hardware to be recycled over and over. These plans are in line with SpaceX's stated goal of bringing the cost per launch to $50-$100 per pound, down from the typical $10000 per pound. The concept video for the idea has been reproduced below. I suggest making it full screen so you see the details. The original can be found on the SpaceX website. The closest thing to a reusable launch system was the shuttle, with the orbiter and two solid rocket boosters able to be reused after several months of refitting work. The average cost per shuttle launch was $1.5 billion, with a cost of over $10000 per pound every launch. As Elon Musk, the founder and CEO of SpaceX states, creating a reusable Falcon 9 will "allow for about a 100 fold reduction in launch costs." While a date has not been established for testing their reusable Falcon 9 concept, this will not be the first time SpaceX has revolutionized the space industry. To see more on their accomplishments check out the SpaceX website! I previously wrote an article on why SpaceX is winning the race to Mars, which discusses some of their many accomplishments and plans. Today's Mars Photo shows an area recently crossed by numerous dust devils. Dust devils are similar to small tornadoes and are common on Mars. The dark veins are the result of dust devils picking up bright dust and exposing the darker, less dusty surface. 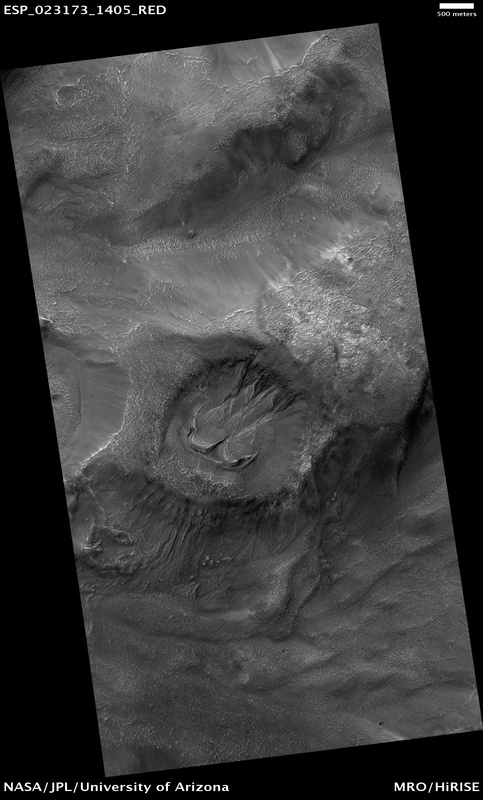 The image below links the original image which has a captioned provided by the HiRISE team. Today's Mars Photo was taken by Mars Reconnaissance Orbiter's HiRISE camera and shows the floor of a large degraded crater. But what are you seeing? The terrain seen is called yardangs which form when erosion is primarily caused by wind. Yardangs are identifiable by the multiple sharp ridges that are oriented in a similar way. The darker areas are low areas where dark sand is present in between the ridges. The sharp ridges are shaped by the heavy wind that has eroded them over millions of years. 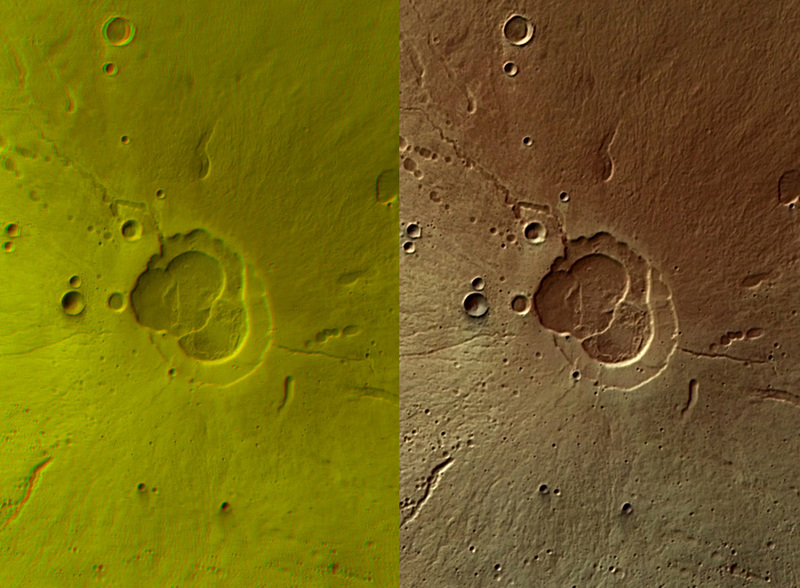 Clicking the image will take you to the original image with a caption provided by the HiRISE team. Todays Mars Photo is jumbled terrain in Ius Chasma. The brighter areas are sulfate, a mineral which, on Earth, usually forms in the presence of water as an evaporate. The brighter sulfates are folded over themselves and jumbled. They could have been deposited this way in a landslide, or become disrupted after being deposited by tectonic activity that broke and folded the sulfates. This image was taken by Mars Reconnaissance Orbiter's HiRISE camera. The image below will link to the original captioned image. Today's Mars Photo is of Hecates Tholus Volcano as taken by the European Space Agency's (ESA) Mars Express in 2004. See the photo in 3D. This image below will take you to the larger hi-resolution image from the ESA. Today's Mars Photo was taken by by Viking I Orbiter as Phobos' shadow passed over the surface of Mars. Viking I Lander took a simultaneous picture, which was used in conjunction with the Orbiter's image identify the position of the shadow, and thus the lander itself. The shadow of Phobos is in the center of the image and is about 60 by 120km across and in the Chryse Planitia region just a few kilometers north of the Viking I Lander. 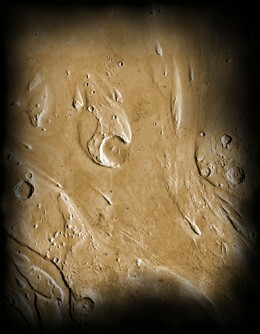 Maurnee Vallis is shown in the below and to the left of the center shadow. Today's Mars Photo was taken by Mars Reconnaissance Orbiter's HiRISE Camera and shows Mars Exploration Rover Opportunity at the rim of Endeavour Crater. This view of Oppy is one of the clearest of the rover on the rim of Endeavour Crater, but just in case you can't see it, it is pointed out in the animation. The colorization and animation of this image were once again done by The Road to Endeavour and so the image will link to the article which hosts this picture. Today's Mars Photo was taken by Mars Exploration Rover Opportunity on a rock being called Salisbury. Oppy been brushing this area clean of dust and drilling into it with its rock abrasion tool for the past few days. This allow the rover to get a view of the 'raw' rock beneath the weathered, dust-covered surface. The rover is continuing to use its microscopic imager to determine what the rock is made of and learn more about its past. This photo was colored by The Road to Endeavour Blog, one of the leading authorities on everything related to MER Opportunity. Clicking on the image below will take you to the post where he discusses Salisbury in much more detail with numerous photos. 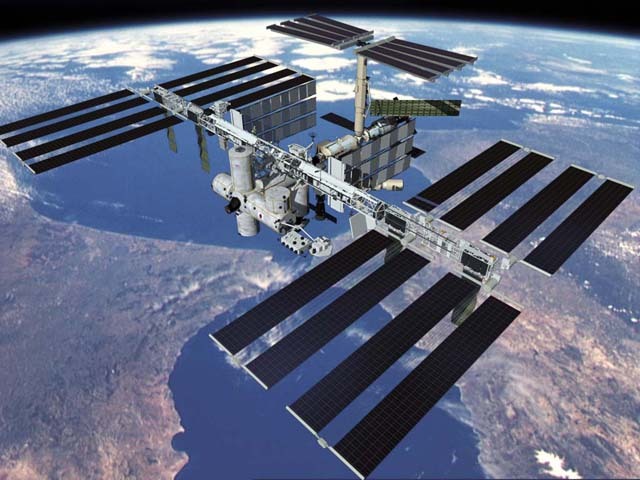 The International Space Station (ISS) will allow humanity to send much larger payloads into space and act as a launching platform for vehicles to Mars and other extraterrestrial bodies. Prior to the existence of the ISS we had been forced to limit the size and weight of everything we sent into space because we had to send it all in one piece. Now we can send everything in smaller pieces and have them dock with the ISS, at which point they can be put together. This means that rather than design a more powerful rocket to send out deep space missions we can assemble spacecraft in orbit. Once the craft has been put together it can launch from the space station using much less force than would be necessary from Earth's surface. This is because the ISS is in Low Earth Orbit (LEO) and already moving at around 8 km/s, thus the change in speed needed to reach Earth's escape velocity is much less. Escape velocity from Earth's surface is about 11.2 km/s, which means that a ship must accelerate to that velocity from a motionless state. Escape velocity from LEO is a little less than from the surface at about 10.9 km/s, but since the ISS is already moving at around 8 km/s a craft launching from it will only have to accelerate 2.9 km/s to reach escape velocity. It is impractical for a spacecraft leaving from the surface to attempt to reach escape velocity because moving at that speed in the atmosphere would cause it to burn up due to friction or be destroyed by atmospheric pressure. While there are ways around these problems, they only add unnecessary cost and bulk to the spacecraft. Because the atmosphere is much thinner in LEO objects can attain escape velocity without encountering as much friction. Launching from the ISS will allow a spacecraft to escape Earth's gravity without as much wear on the craft itself. With less acceleration needed and wear sustained, much larger ships could be pieced together, fueled, and launched from the ISS, thus eliminating the need to develop even more massive rocket boosters to launch from the surface into deep space. A rocket could be launched from the surface to the ISS carrying part of the spacecraft inside it. The spacecraft itself would not experience any wear and could be offloaded at the Station. Once the pieces are put together and the spacecraft fueled, it could then propel itself, accelerating the additional 2.9 km/s and escape Earth's gravity. Once it does this the craft would be able to use momentum to take it where it needs to go. A reserve fuel supply could enable any needed course corrections and thrusters for landing on Mars or other terrestrial bodies. A separate unmanned ship full of fuel could have left prior to the manned mission and be waiting on the surface. It may even be possible to generate fuel from the environment of the extraterrestrial planet by converting it to Hydrogen gas, or other usable material. But that's a different topic entirely. Whether we send humans to Mars and beyond or just more robots, the International Space Station will be instrumental in allowing us to deliver larger payloads further into space. 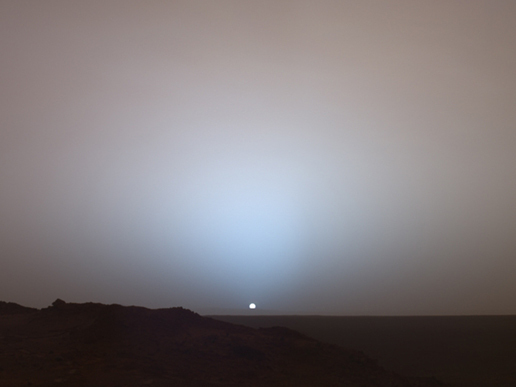 Today's Mars Photo is of a Martian sunset as taken by Mars Exploration Rover Spirit on May 19 2005. The photo was taken as the sun sank below the rim of Gusev crater. Clicking on the photo will take you to NASA's page for this image where they give some background on Martian sunsets and the photos taken of them by the Mars rovers. 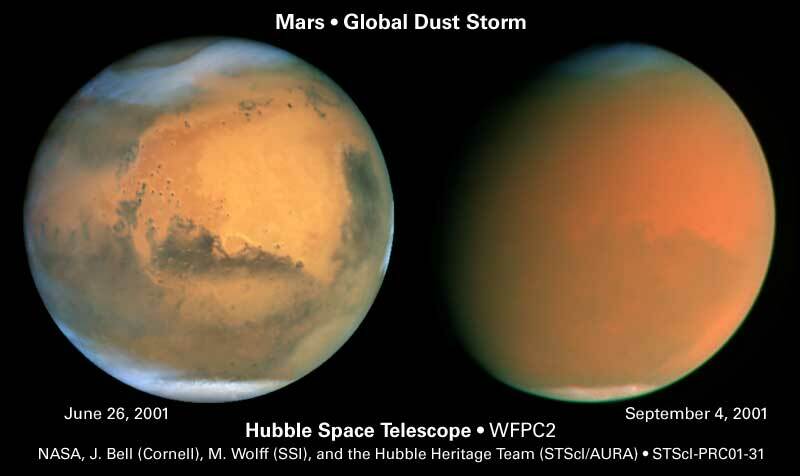 Today's Mars Photo is a comparison of two photos taken by the Hubble Space Telescope in 2001. In the June 26 2011 image a dust storm has begun in Hellas Basin (the oval at the 4 o'clock position of the image) and at the northern polar cap. The image from September 4 2001 shows the entire surface obscured by the dust storm. This comparison image shows the largest dust storm seen on Mars in decades and illustrates how quickly these legendary Martian dust storms form. There is no doubt that if we ever send a manned mission to Mars we will have to prepare for these huge storms, which seem to be a annual occurrence during the summer. I found this image while looking at an old article on Space Today Online, so the image will link to the article, which has more details on Martian sand storms. These days NASA is on the congressional chopping block. Their budget was cut from $18.7 billion in 2010 to around $17.9 billion in 2011. Despite this, NASA has pledged to continue funding its most expensive flagship programs, the James Webb Space Telescope (JWST) and Space Launch System (SLS) with Orion Capsule, despite the JWST costing a third more than originally expected. The original price tag on the telescope was $6.5 billion, but that has since been revised to $8.7 billion. The senate has said JWST will get $530 million in 2012, which is around 3% of the annual budget. This is just for the JWST; the SLS will cost around $3 billion annually, which is 16.8% of the budget. These programs are immensely important for the advancement of science and discovery, but they will take up almost a fifth of NASA's overall budget annually. If NASA's funding is cut it will create uncertainty for the future of projects that were counting on NASA to fund them, but which may be deemed not important enough to continue. If NASA funding smaller projects is such a liability, why don't those projects go elsewhere? The simple answer: there is no real precedence. Who else has the money to fund space projects that cost millions, if not billions of dollars? If NASA decides it cannot afford to fund a sample-return mission from Mars, is there any other way for that important project to get funding? What about other important space missions and projects? If there was a viable alternative means of funding for space projects, wouldn't it have emerged already? Today's Mars Photo is of banded features imaged by the HiRISE camera aboard the Mars Reconnaissance Orbiter. No one is sure what caused the features you see, but they may be expressions of layered rock, shorelines from an ancient lake or ocean, the result of ejecta from an impact, or simply terraces. The Martian landscape is just as varied and beautiful as our own. I can't wait until the day humanity steps foot on Mars and can see everything with out own eyes. That will be a remarkable sight for sure. The image links to the HiRISE page which discusses this image and its location on Mars. Today's Mars Photo is of Mars Exploration Rover Opportunity using its microscopic imager. It is important to understand how Oppy takes its microscopic photos so that we can understand the limitations of such a device. We can see from its size that it will not fit into small crevices and that it is not meant to be maneuvered into right spaces. The camera is primarily used for zooming in close on rocks on the surface of Mars, but not much else. Understanding the limitations of the Mars rover lets us see why it is important that we send a manned mission to Mars. Machines can only do so much and are not as adaptable as humans are, thus to truly understand and explore Mars we must send people. This image is larger than the original so clicking it will instead take you to all Mars Photo of the Day posts. Today's Mars Photo is of a crater in Nereidum Montes as taken by the CTX camera on the Mars Reconnaissance Orbiter. The crater has numerous gullies on its southwest walls and rim. There are also two instances of ear-shaped (lobate) material that is associated with gullies within the crater. This features provide additional evidence that water once existed in excess on Mars. It is hoped that a link between the lobate material and interior gullies can be firmly established when HiRISE takes more hi-resolution images of the crater. Click on the image below to see the original, full page photo from the HiRISE site. Today's Mars Photo shows more of the fascinating rocks that surround Odyssey Crater. This image from Mars was taken on Sol 2707, but just arrived today (Sol 2714). The beauty of the Martian landscape never ceases to amaze me. I know a lot of people would like to travel to Mars so we could see with our own eyes the magnificence that Mars Exploration Rover Opportunity bears witness to day in and day out. 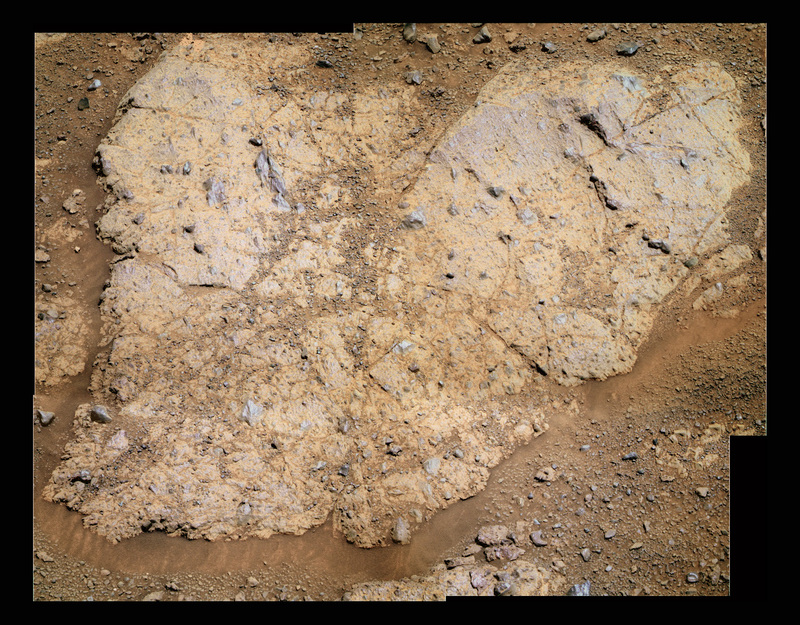 These rocks will likely be bypassed as Oppy makes its way to Cape York, but there are sure to be many more along the way! Click on this image to see the original, much larger image ans soak it in! Today's Mars Image of Mars is another photo with a lot of meaning. This photo was taken on Sol 30 of Mars Explorarion Rover Opportunity's exploration of the Martian surface. It was found, colored, and enhanced at The Road to Endeavour blog. When Mars Exploration Rover's Spirit and Opportunity were being created the MER team wanted to pay tribute to those 2,977 lost during the 9/11 attacks, but how could they do that when their greatest achievement would be millions of miles away on Mars? It was decided that both rovers would contain pieces of the wreckage from the Twin Towers and that they would bear them forth to a new world, Mars. The pieces were shaped into rectangular plate covers for cables and placed on the robotic arm of each rover. These plate covers are marked with the American flag. These small plate covers also symbolize human polarity. There will always be evil acts committed by members of our species, but there will also be magnificent achievements made, like the Mars travel and subsequent exploration that is happening every day. 9/11 will always be remembered, on two planets, not just one. This image links to the original hi-res, colored image from The Road to Endeavour. Today's Mars Photo will take us back to Sol 2347 of Mars Exploration Opportunity's time exploring Mars. This image is largely symbolic of Opportunity's overall experience on Mars. There have been many ups and down along the way, but the Mars Rover has stayed the course and continued doing science no matter the obstacles arrayed against it. We have learned more from Opportunity then anyone could have hoped. That little rover affectionately called Oppy, has continued to push the boundaries of human knowledge and exploration, even when most of humanity seems content staying on this little rock we called Earth. The road behind us is full of hills and valleys and the road ahead promises more of the same, but if we stay the course and keep going no matter the impediments arrayed against us we will become stronger and wiser for it. This image is larger even than the original, so clicking on the image will instead take you to a blog that has been dedicated to Oppy's Road To Endeavour for years. Today's Mars Photo shows a slab of exposed bedrock at Mars Exploration Rover Opportunity's current location. Opportunity has pulled up to this heart-shaped bedrock and will likely be studying it for a few days. The rock has been named Chester Lake by the MER team for reasons currently unknown. This image is a compilation of photos as taken by Opportunity's panoramic camera. It was compiled and colored by Stuart Atkinson from The Road to Endeavour blog. Please note that this is not the true color, but it has been "enhanced and sharpened" to bring out subtle details on the rocks surface and in its surroundings." See a similar 3D image of this heart-shaped bedrock from the same blog. Clicking this image will take you to the original, much larger image. Today's Mars Photo is from Mars Exploration Rover Opportunity as it leaves behind the grouping of Tisdale rocks around Odyssey Crater. This comes after Opportunity spent a few days examining the various ejecta and determined that the rocks were unlike any others examined on Mars. 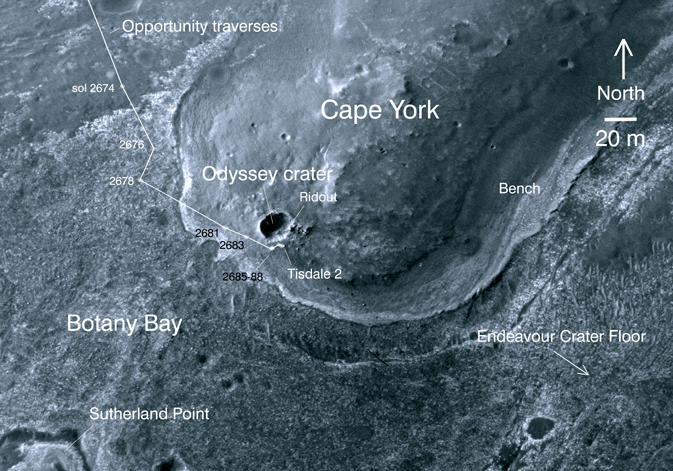 Opportunity is now headed off to Cape York as it continues its search for the clay minerals discovered by the Mars Reconnaissance Orbiter that indicate Mars may have once been habitable to life. The photo links to the original. In the race to the Moon the primary competitors were the Americans and the Soviets and their state funded space agencies. At the beginning of the space race the governments of both countries invested heavily in their respective space agencies because it was deemed in the best interest of their countries. America successfully sent a manned mission to the Moon on July 20, 1969 and after a few more landings, during which time the Soviets were unable to launch their own manned mission, they essentially declared victory and to this day humanity has never sent a man beyond low-Earth orbit. Thus the first space race led to one of mankind's greatest accomplishments, but culminated with disappointment for millions of space enthusiasts. A government is a broad organization that is responsible for everything from the economy to national defense to food regulation. It makes sense that governments cannot focus on space travel and exploration when there are more pressing responsibilities closer to home it must deal with. Governments have so many tasks and responsibilities it is easy to see why exploring space has been relegated to the back burner. Space enthusiasts have long despaired over the lack of nationalistic fervor that once drove the space industry, fearing that further exploration and research would all but end in the years to come. That fear has been misplaced. 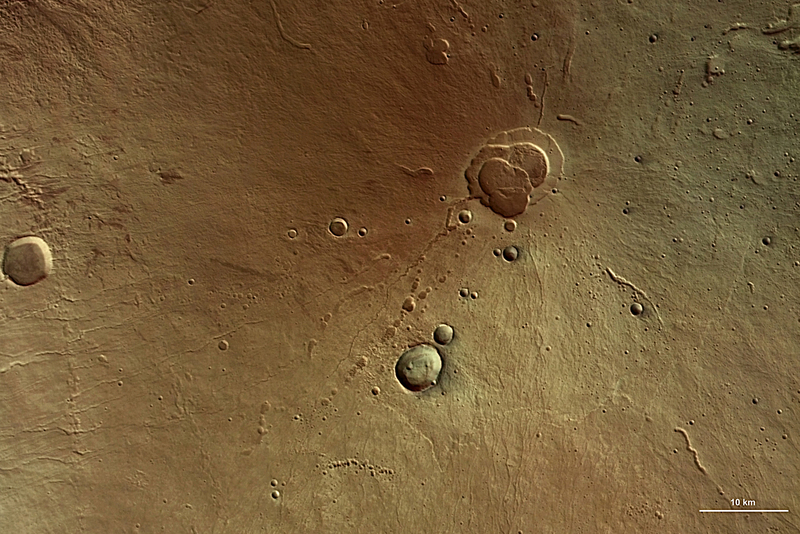 Today's Mars Photo is of Cape Tribulation. The image was taken by Mars Exploration Rover Opportunity as it rolled up to Spirit Point in August 2011. Data from Mars Reconnaissance Orbiter's CRISM camera indicates that there is a large quantity of exposed clay minerals on Cape Tribulation. 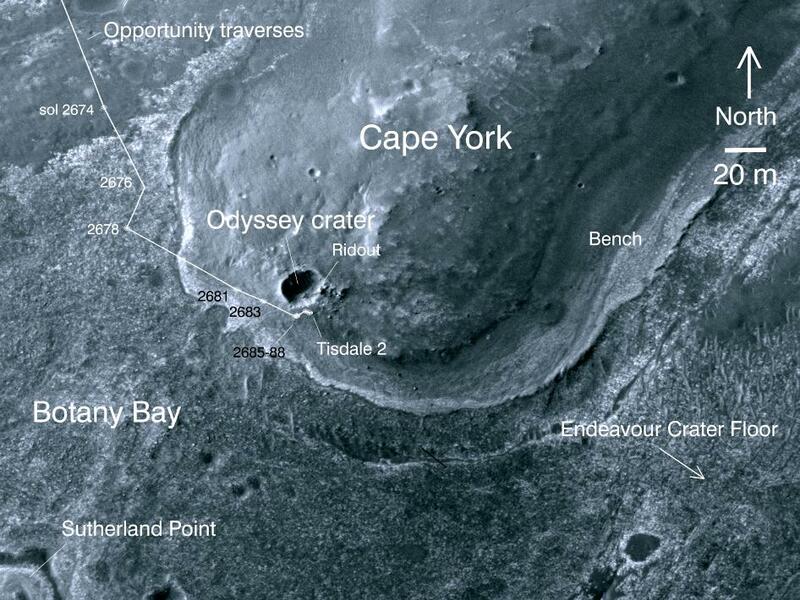 NASA has stated their current mission with MER Opportunity is to explore Cape York, after which they will attempt to climb Cape Tribulation. This is all assuming the aging Mars Rover remains operable throughout its new mission. This image is from The Planetary Society and their monthly update on Opportunity. The image was rendered in color by Stuart Atkinson, author of The Road to Endeavour. To see the full hi-def image simply click on the one below. Today's Mars Photo was taken by the European Science Agency (ESA)'s Mars Express. 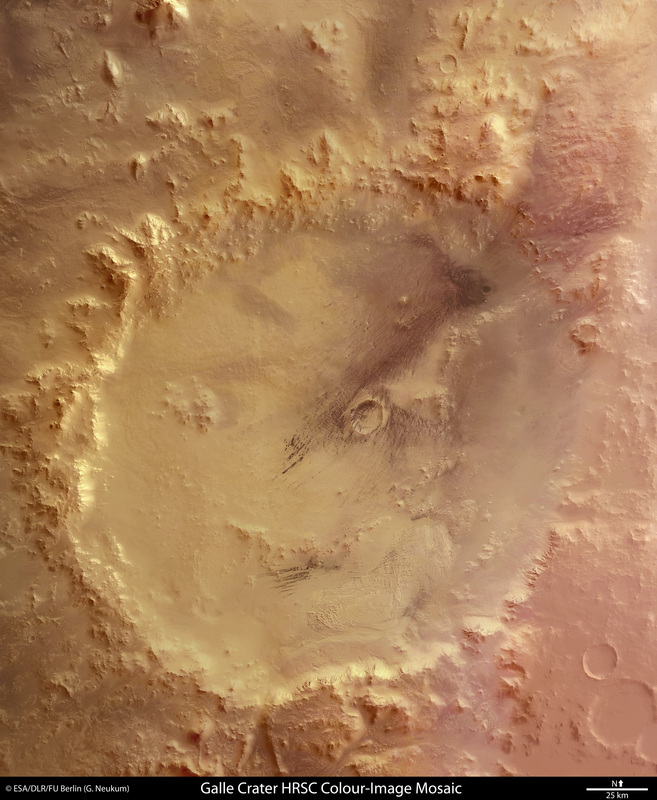 This photo of Mars is evidence that a massive lake once existed within Eberswalde Crater, which measures 65 km in diameter. The delta is thought to have formed 3.7 billion years ago during the Hesperian Epoch, when an asteroid struck the Martian surface. Prior to this discovery it was thought that Mars was a barren, frozen planet, during the Hesperian Epoch, but the existence of this lake proves that there was liquid water present on the planet. 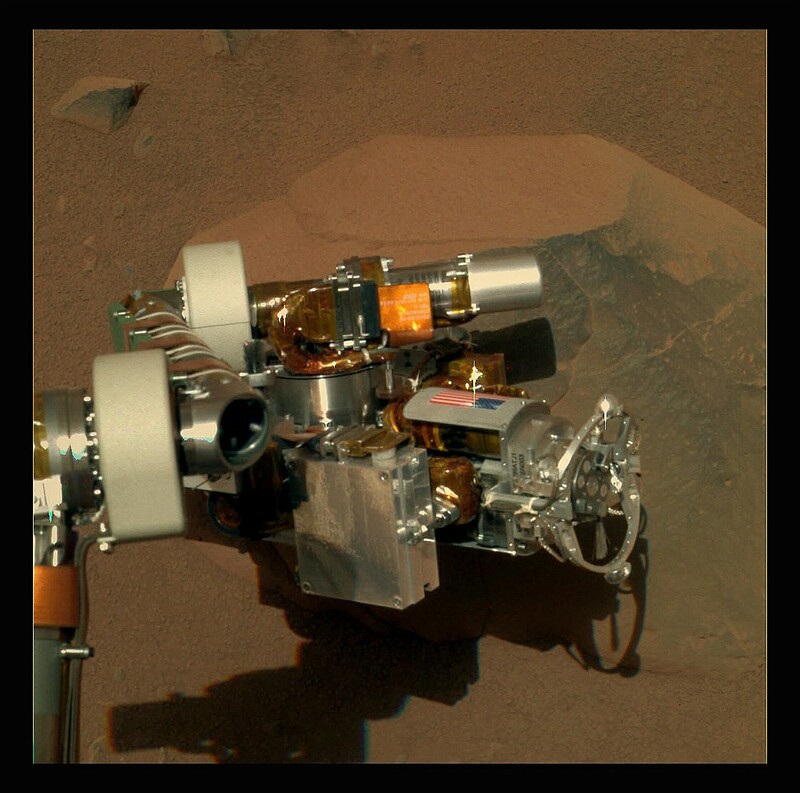 Todays Mars Photo was taken by the Mars Pathfinder in Ares Valles on July 4 1997. The large boulders in the image were most likely deposited by the catastrophic floods that created the valley. The sky is reddish brown because of the dust particles abundant the atmosphere. Today's Mars Photo was taken by Viking I shortly after landing on July 20 1976. It was the first photo ever taken from the Martian surface. 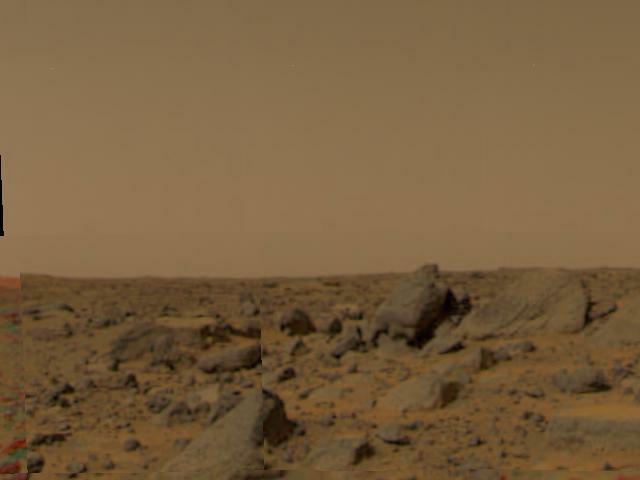 When we compare this image to a more modern photo of Mars like this one, it is amazing how far our technology has come. 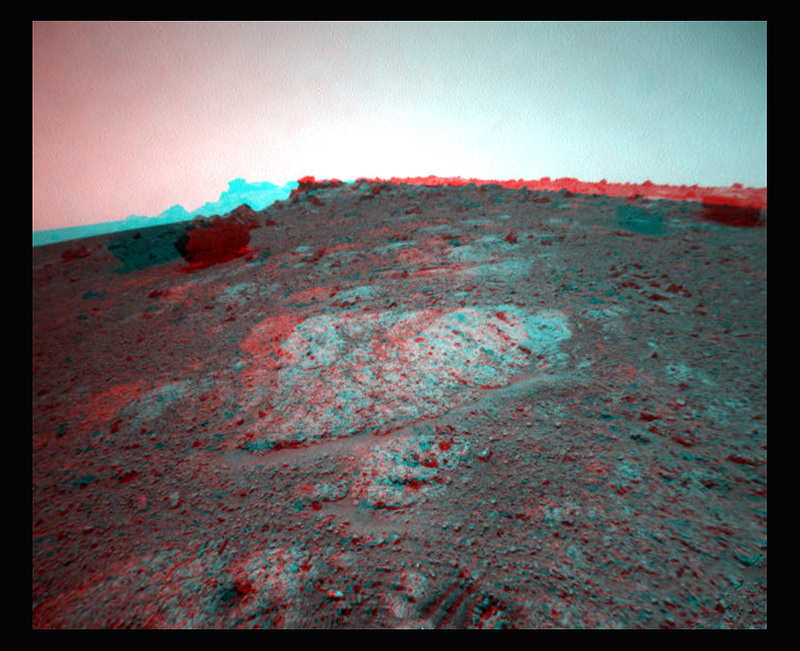 Could you imagine getting photos from Mars Exploration Rover Opportunity that looked like this? How disappointing would that be? The image here is as large as the original, so I have linked it to the NASA's informative page on the image. Today's Mars Photo shows the path taken by Mars Exploration Rover Opportunity in recent weeks. This photo was taken by Mars Reconnaissance Orbiter's HiRISE camera. I kept the labels added on by NASA because I know how hard it is to remember where everything is when you hear about Opportunity's discoveries. Hopefully you can use this image as a reference. Clicking on this image will direct you to an article about Mars Exploration Rover Opportunity, its status and new mission. See the larger, original image. Today's Mars Photo is of of a large rock named Trailbraker that is located in the vicinity of Odyssey Crater and the Tisdale rock clan. This rock is larger than any of the rocks in the area, but will not be further investigated since Mars Exploration Rover Opportunity is set to leave the Tisdale site and head north where the Mars Reconnaissance Orbiter has detected clays with a chemical composition never before examined. This photo is as large as the original image, but you can still click it to see it hosted by NASA.